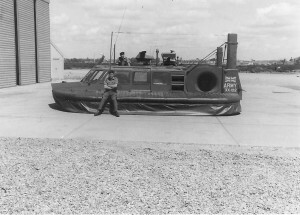 The first hovercraft an SRN1. Stokes Bay has played an important part in the development of the Hovercraft. Its inventor Sir Christopher Cockerel worked on the first hovercraft from 1955. 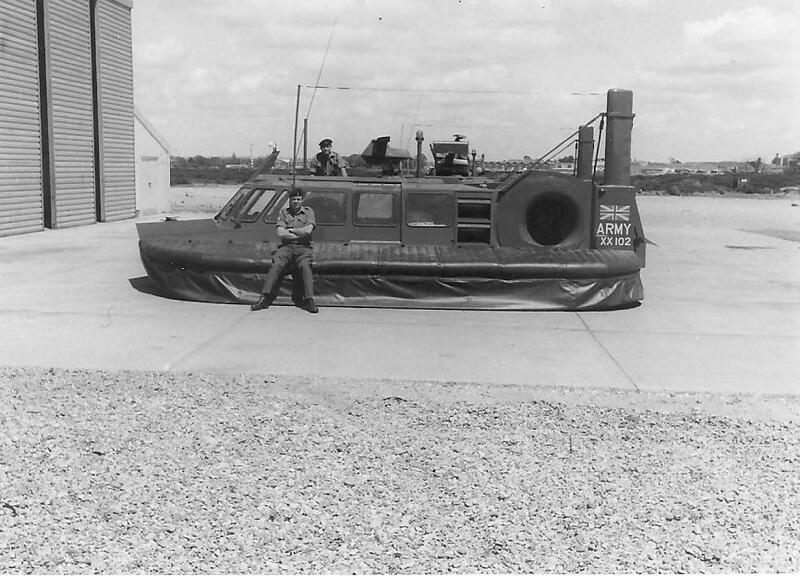 In the autumn of 1958, the National Research Development Council placed an order with Saunders-Roe for the first full-scale hovercraft. This prototype craft was designated the SR-N1 (Saunders-Roe – Nautical One) and was manufactured under licence from the NRDC. 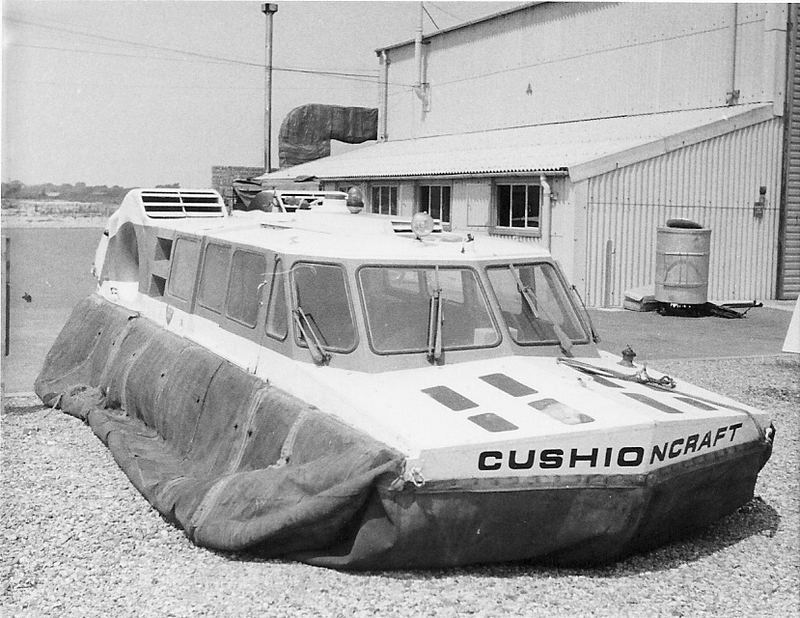 In January 1959, the NRDC formed a subsidiary called Hovercraft Development Ltd. Cockerell was the Technical Director and the company controlled the patents which it used to license several private sector firms to manufacture craft under the registered trademark of Hovercraft. On 11th June 1959, Christopher Cockerill’s prototype hovercraft SR-N1 made its maiden flight in the Solent from HMS Daedalus. Following the success of the flight, hovercraft development continued, at Stokes Bay. The very first two Hovercraft passenger routes were from Stokes Bay to Ryde and Southsea to Ryde using two SRN6 Hovercraft. 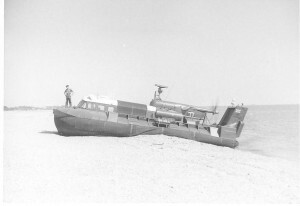 In March 1965 Gosport Council considered an application for the use of a section of beach south of No.2 Battery Stokes Bay, by Hovertravel to operate a cross Solent Hovercraft passenger service, for a temporary period not exceeding twelve months exipring 31 May 1966, until a permanent site could be negotiated, preferably on MoD land at Browndown. The company only required this site so that they could gain practical experience running a hovercraft service whilst negotiations proceeded for a permanent site. The use of this site, the Council noted, might require the re-siting of sixteen day huts, or compensation to the owners whilst the hovercraft was operating. Car parking was to be provided for 140 to 150 cars, maximum. In April 1965 Gosport Borough Council noted in its minutes the proposed hovercraft service at No.2 Battery to Ryde that summer. The Company hoped to get a permanent site on Ministry of Defence land to the West of No2 Battery. The Council proposed to monitor the noise and move the 16 day huts if necessary. A brand new 38-seat SRN6 was to be used with a demonstration at Stokes Bay on 17 March. Following this the council reported that the hovercraft was much less noisy than expected! 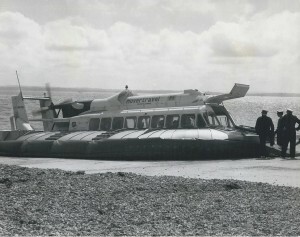 The council minutes noted that the cross-Solent hovercraft service hoped to start at end of July 1965. 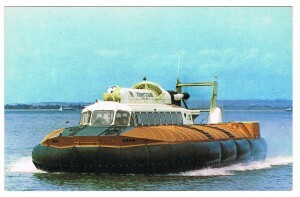 Gosport & Fareham Omnibus Company proposed to run a service to the hovercraft terminal at Stokes Bay. 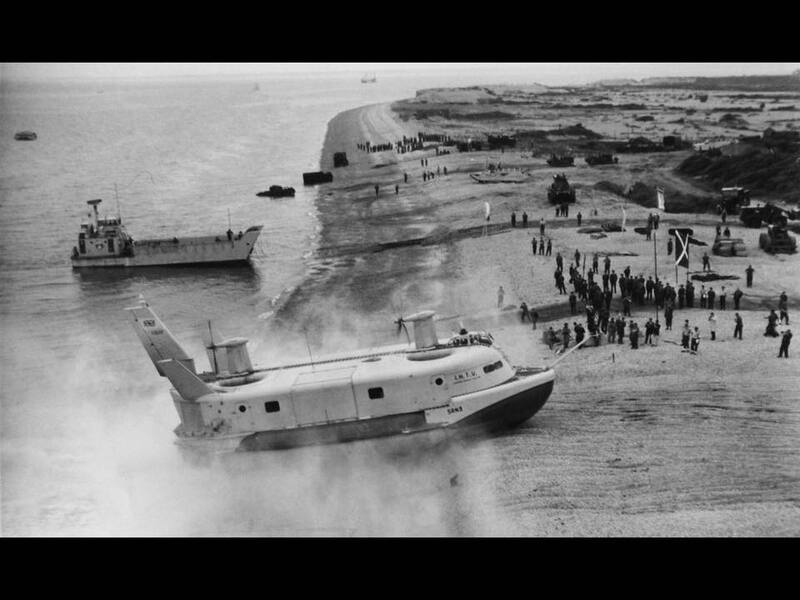 On 24 July 1965 the new Hovercraft passenger service began operating at the west end of Stokes Bay near to No.2 Battery. A slipway was built to allow the SRN6 hovercraft to land. A nearby cabin sold tickets and provided passenger waiting facilities. The service, managed by Hovertravel Ltd. ran from Stokes Bay to Ryde and although it offered a very quick method to travel to the Isle of Wight it also drew a lot of attention from Gosport residents because of the noise. 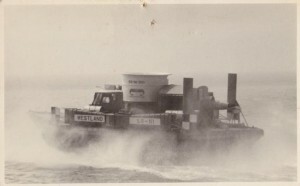 In August 1965 the Council reported that had received 7 letters of complaint (including two from members of the Council) about noise from the Stokes Bay Hovercraft Service. Other complaints received were that the hovercraft caused smell, beach pollution, was using a designated recreational area and traffic problems. In November of that year the Council reported improvements to the noise factor. This included fitting the craft with new skirts, ensuring that the skirts were always in good condition, revising the approach course to the landing slip and fitting a modified steering control designed to improve manoeuvrability thereby reducing noise. Alternative sites were discussed but the one at Gilkicker was no good because it was earmarked for a proposed yacht development and the beach was too steeply shelving; access would be difficult for traffic; it was too close to the Gilkicker Lloyds Signal Station. MoD land at Browndown was preferred as a site for the terminal but negotiations with the MoD had not so far been successful. The Council agreed that complains of noise had been addressed whilst complaints of smell and beach pollution were not justified. The fact that the terminal was on recreation land was not ideal butexcept for its close proximity to residential development the present site was ideally suited to the operation of the hovercraft. In June 1966 the Council agreed to extend the operating licence of the Stokes Bay Hovercraft Terminal until 30 Sep 1967. 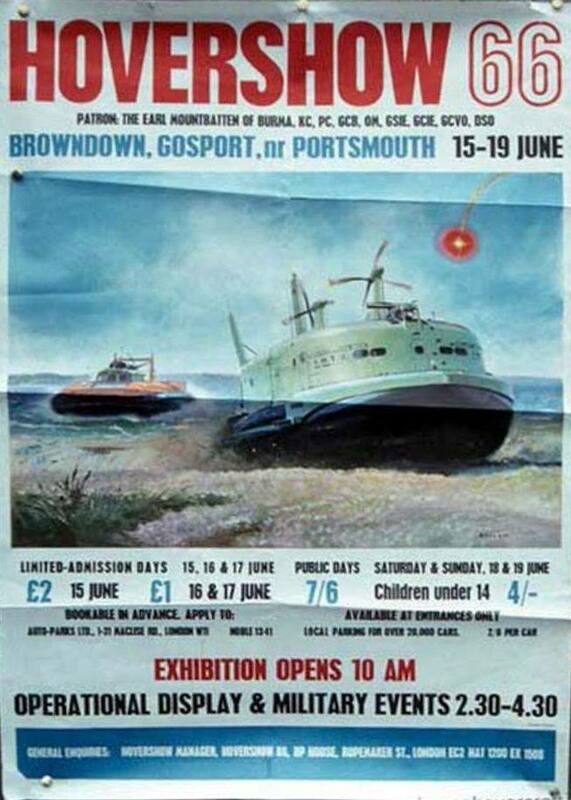 In May 1966 the Council minuted that Hovertravel Ltd wanted extra services at Stokes Bay whilst the Hovershow66 was happening at Browndown 15-19 June. They wanted more than 2 services per hour between 10:30 and 17:30. In July 1966 it was reported that Ministry of Housing and Local Government approval was needed for the hovercraft service to continue. In October 1966 the council proposed to charge the hovercraft service £750 p.a. rent (was £500 last year). The service was not a success, probably because Gosport is on a peninsular and the Portsmouth service from Southsea beach was nearer to a mainline train station and easier to access. Services from Stokes Bay ended on 28th September 1968. In September 1968 the Council reported that regarding the Hovertravel Terminal Stokes Bay – there had been no service during Summer 1968 but the Company wished to retain an interest with occasional use to test new Vosper Thorneycroft hovercraft. In February 1969 the Council minuted that they intended to renew the licence at Stokes Bay Hoverport until 28 Feb 1970 to Hovertravel Ltd for experiments. GH2012 arrives at Stokes Bay July 1965 on its inaugural flight with Island governor, Lord Louis Mountbatten, on board. 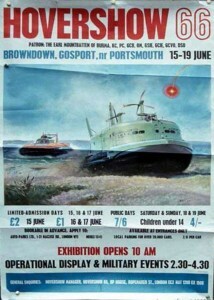 On Wednesday 15th June 1966, the world’s first Hovershow opened at Browndown. The show ran for five days, and was officially opened by Viscount Lord Louis Mountbatten, who arrived on a helicopter, landing in the grassed area behind Stokes Bay Sailing Club. It was expected to attract up to 4,000 official visitors by closing time on the Sunday. 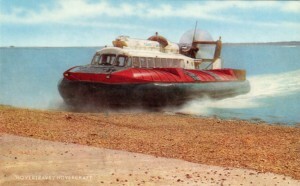 The show was intended to promote export sales of hovercraft. The government order was for two new prototypes, a fast patrol boat capable of 75 knots and a logistics support craft. 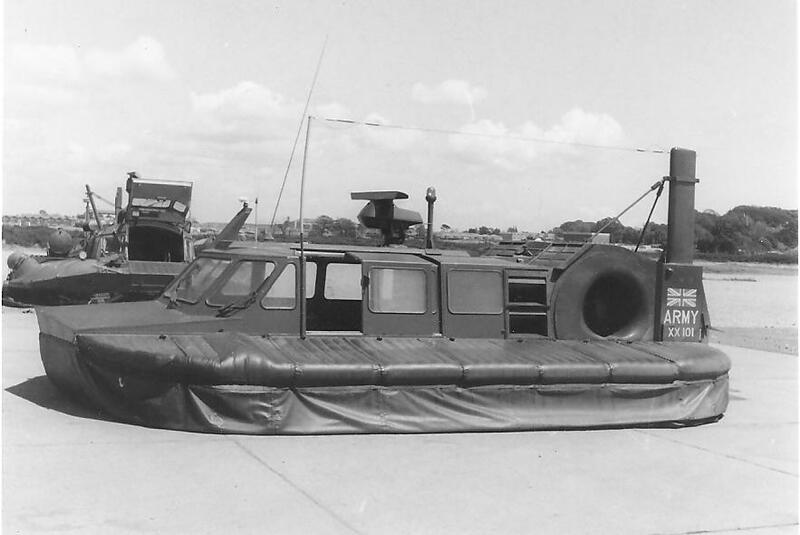 SRN3 Hovercraft of the IHTU at Browndown during Hovershow 66. In the same year that Hovershow66 took place at Browndown a new Hovercraft Trials Unit was established at Browndown, called the 200 Hovercraft Trials Squadron. 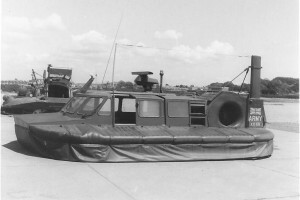 Two years later it was named 200 Hovercraft Squadron Royal Corps of Transport. The I.S.T.U. was based at Browndown, located at the west end of Stokes Bay, close to Browndown Battery. 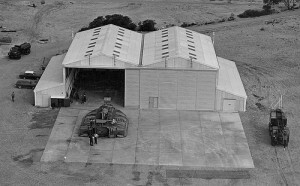 It consisted of two purpose built joined hangers and ancilary buildings. 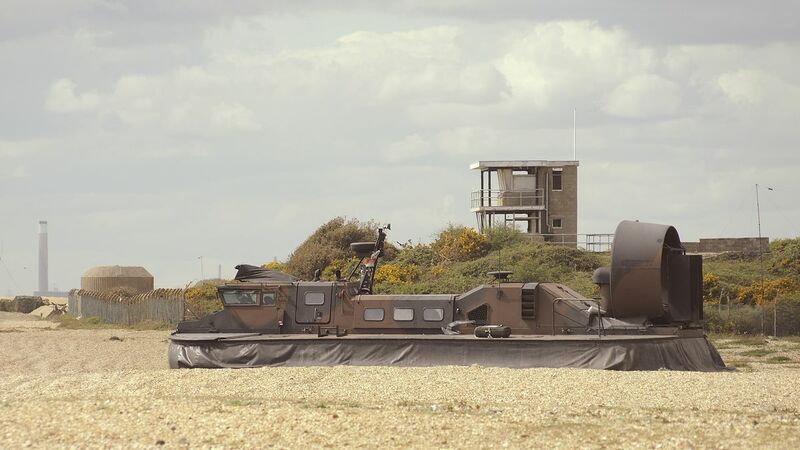 Hovercraft were tested over the area of the adjacent shingle beach and across the Solent to the Isle of Wight. An observation post was constructed on top of the old Victorian Browndown Battery and this is still in place today. 200 Hovercraft Squadron photos appear with the kind permission of James Hutchinson. 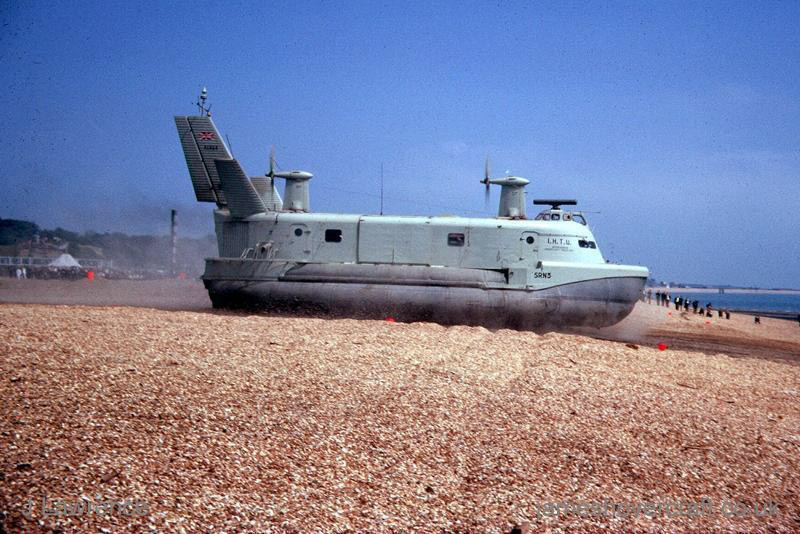 The Hovercraft Museum based in Lee-on-the-Solent is home to the world’s only collection of historic hovercraft. Based on the former HMS Daedalus site at Lee-on-the-Solent, the Museum currently has 75 hovercraft plus an archive and library on site.